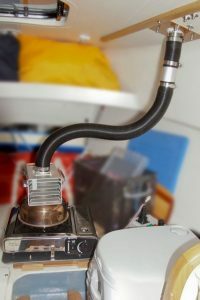 The “Pan 2000” heater consists of an upside down stainless “pan” surmounted by an alloy heat exchanger through which a 12v computer fan blows air giving a warm air stream. 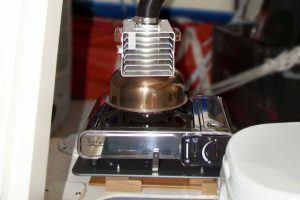 It is designed to sit on top of a cooker ring. 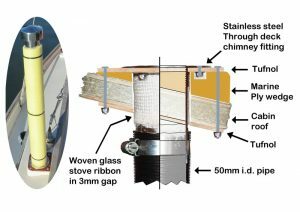 The gases from the stove go up through a pipe to be vented outside the cabin to prevent CO build up and to minimise humidity. The PAN2000 appears expensive, it cost me over £400 by the time I’d got it imported from Sweden. However the heat exchanger plates would be complicated to make oneself, and the cost is less than, for example, a charcoal boat heater. On the other hand it comes with a through deck fitting similar to that used for filling with water or fuel. It would have to be fitted in a location sheltered from rain, perhaps under the spray hood. I had a chimney made (see below). 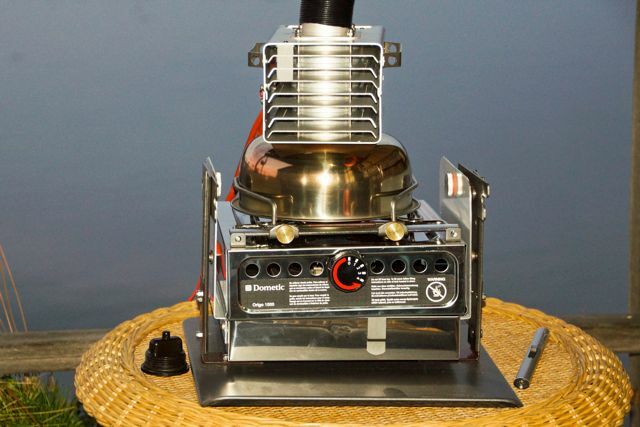 Heat Source: Flat Butane heater (as recommended by Swallow Boats for cooking). 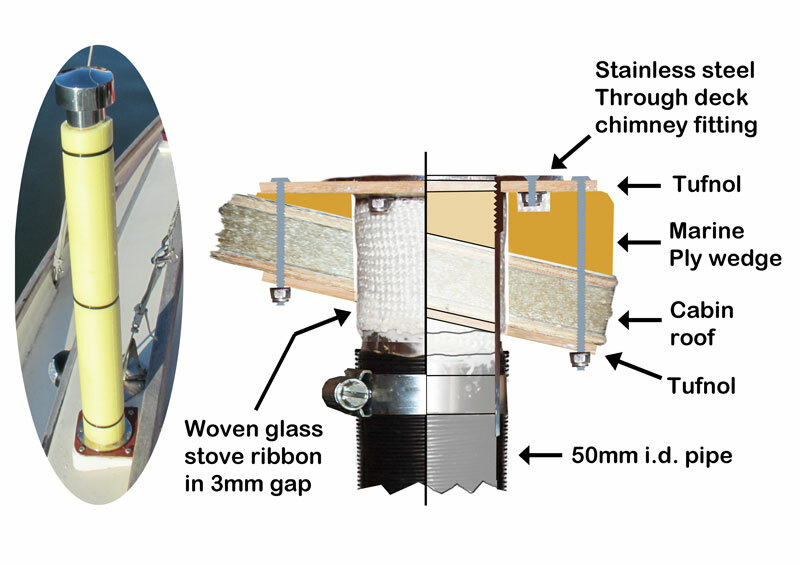 Make sure it is specified for indoor use with a mechanism to cut the gas if the flame goes out. Not all similar looking heaters are the same! I have mounted it on a metal plate fastened to a plywood mount that slots into holders fastened in the forepeak. It seems disappointing to carry both bio-ethanol (for cooking) and butane (for heating). However the spirit stove gives me a heating source for very cold weather. Butane has half as much again heat content as ethanol so using it saves weight compared to carrying ethanol for heating. Unless you want to use your boat in the depths of winter, a single butane stove could serve for heating and cooking. 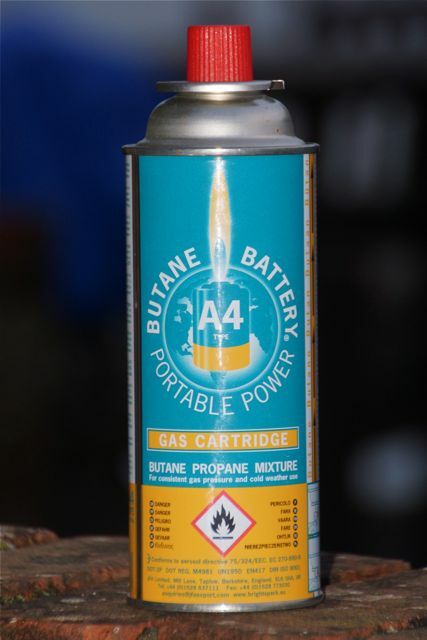 Note (added 2017): I have now converted to cooking using a butane stove so I only have one type of fuel.